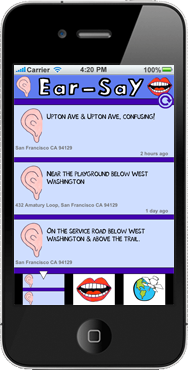 Create Audio Graffiti— Ear-Say is a personal broadcast & listen location based sound app. Leave behind recordings tied to the place you're at, and the next person that visits the same place can hear what you said.  How can I record and listen to sounds? Tap the browse tab to scroll through a list of all recorded audio. 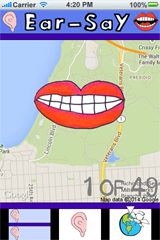 Tap an ear to hear a recording, and tap an address to filter the list by location. 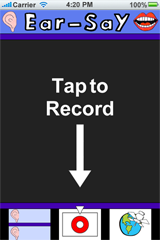 Tap the mouth tab to go to record mode. You can anonymously record up to 15 seconds of sound linked to your current location. Tap the globe & satellite tab to enter location based listening mode. Whenever you travel to a location where you or someone else left behind a recording, that sound will automatically play. Listening mode works in the background too-- even when the app's in the background if it's in listening mode recordings found at your current location will automatically play.  Can I listen to sounds on the web without the app? 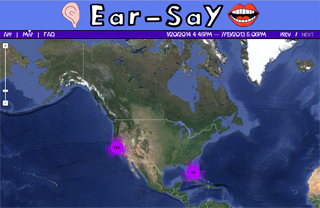 Yes, Ear-Say sounds can play in any web browser. 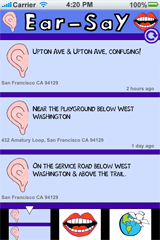 Follow the Map link on this page to locate all recorded sounds on a Google map. Zoom into the map to reveal locations where sounds were recorded. Click an ear icon to hear the sound recorded at that location.